He was commander in the Mughal Army under Babur and then as the governor of Bihar. When Babur's son Humayun was elsewhere on an expedition, Sher Khan overran the state of Bengal and established the Suri Empire. During his reign, he set up a new template for civic and military administration, issued the first Rupee and re-organized the postal system of India. He struck silver Tankas and Rupees from his commenced base area of Bihar and Bengal. As his empire expanded mintless silver and copper varieties were produced. The same applies to the copper coins struck at Kalpi of which numerous varieties exists. He was the second son of Sher Shah Suri. On his father's death, an emergency meeting of nobles chose him to be successor instead of his elder brother Adil Khan. Islam Shah's coinage follows the same pattern as his predecessor's silver Rupees and copper paisas. A few gold coins are known but their status in some cases are uncertain. Islam Shah's twelve year old son Firuz Shah Suri succeeded him in Gwalior by the nobles, but within days, he was assassinated by Sher Shah's nephew Muhammad Mubariz Khan who ruled as Muhammad Adil Shah. 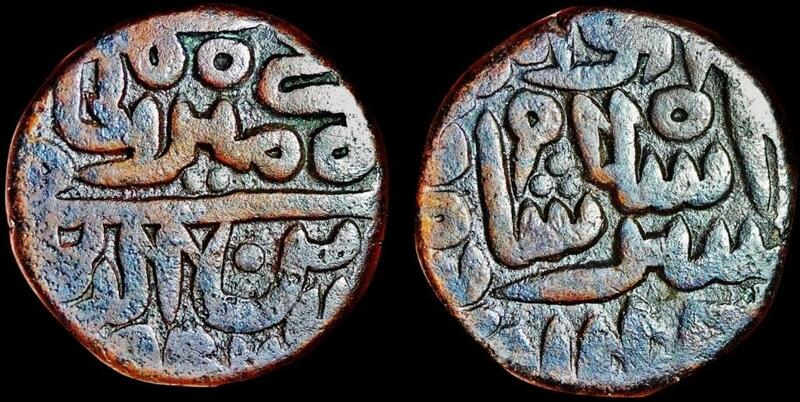 Only a single extremely rare copper paisa coin is known on Firuz Shah dated AH 960. He was son of Sher Shah Suri's younger brother Nizam. He appointed Hemu as his Wazir. Muhammad lost both Delhi and Agra and made his headquaters further east, probably at Chunar or Qanauj. His coins shows mint places like Jhusi, in Allah district and P(r)ayag (old name of Allahabad) and some even from Jaunpur. Commonly found coins are from Shergrah and certain mintless type. Paisas and half paisas are common, but smaller coins are rare. He was the brother-in-law of sultan Muhammad Adil Shah. He was the governor of Lahore before declaring independence from Delhi in 1555. Most of Sikandar Shah Suri's coin are rare, mostly dated AH 962. A silver rare Rupee from Lahore mint is dated AH 961 and AH 962. One or two type of silver Rupees are also known to be struck at Agra. Several types of copper coins are known, including fractions, all of which are mintless. Ibrahim Khan Suri, son of Ghazi Khan and sultan's brother-in-law, who was in charge of Agra, revolted. He defeated the army of Adil Shah and captured Delhi. After this he assumed the regal title of Ibrahim Shah Suri and it was not possible for Adil to defeat him. Ibrahim Shah's silver coins are known, but extremely rare from Agra and Banaras. Copper coins are known as mintless. Soon, the empire founded by Sher Shah was divided into four parts. As Delhi and Agra came under the rule of Ibrahim Shah Suri, only the territories from the vicinity of Agra to Bihar remained under Adil. Ahmad Khan Suri, another brother-in-law of Adil, who took the title of Sikandar Shah Suri after declaring independence from Delhi, brought Punjab under his control. Muhammad Khan Suri, governor of Bengal also declared independence and took the title of Shams-ud-Din Muhammad Shah. Hostility did not end with the division of empire in 1555. After defeating Ibrahim at Farah, 32 km from Agra, Sikandar Shah Suri took possession of Delhi and Agra. Ibrahim renewed his strife with Adil, but he was defeated by Hemu twice, once near Kalpi and again near Khanua. He took refuge in the Bayana fort, which was besieged by Hemu. But, as Muhammad Shah of Bengal approached near Kalpi, Adil had to recall Hemu to Kalpi. Muhammad Shah was defeated at Chhapparghatta near Kalpi. Adil captured Bengal and appointed Shahbaz Khan as governor. He made Chunar his capital. Adil was finally defeated and killed in a battle with Khizr Khan Suri of Bengal in 1557. Goron D808 / R1690 / NW1070A Rupee. Year: AH 946 (1539). Weight: 11.14g. Metal: Silver. Diameter: 24.00 mm. Edge: Plain. Alignment: Medal, but 25% rotated left. Mint: Jahanpanah type: Shergarh in Bihar. Obverse: sher shah al-sultan khallada allah mulkahu sanah date and Nagari (within square). jahanpanah in left margin. Reverse: la ilaha illa l-Lahi Muḥammadan rasulu l-Lahi [Shahada in center (there is no other god but Allah and Muhammad is the last messenger of Allah)] and al-sultan al-adil written below, all in square. Four caliphs in basic form: abu bakar (at the top) - umar (left) - uthman (bottom) - ali (right). Mintage: N/A. Mintage Years: AH 946-947. Ruler: Farid ud-Din Sher Shah Suri. Goron D864 Paisa. Year: AH 952 (1545). Weight: 20.38g. Metal: Copper. Diameter: 21.50 mm. Edge: Plain. Alignment: Medal, but 5% rotated. Mint: Narnol. Obverse: fi ahd al-amir al-hami / al-sultan al-adil al-din al-dunya. Date at bottom. Reverse: sher shah al-sultan Zarb Nirmol (in center square). Legends around the circle. Mintage: N/A. Mintage Years: AH 950-952. Ruler: Farid ud-Din Sher Shah Suri. Goron D914 Paisa. Year: AH 949 (1542). Weight: 20.41g. Metal: Copper. Diameter: 21.50 mm. Edge: Plain. Alignment: Medal, but 25% rotated left. Mint: N/A. Obverse: fi ahd al-amir al-hami / al-sultan al-adil al-din al-dunya. Date at bottom. Reverse: abu'l muzaffar sher shah sultan khallada allah mulkahu. Mintage: N/A. Mintage Years: AH 948-949. Ruler: Farid ud-Din Sher Shah Suri. Note: There are large number of mintless types of paisa and their respective half paisas. Some of the differences are quite small. It is possible that some of these coins do in fact bear mint names which are actually placed at the bottom of the die, rarely if ever occur on the coins as struck. The Suri gold coins published or known are probably pieces made either for jewellery or religious purposes. The Suri silver coins did not conform to the weight of 170 grains of the earlier Sultans of Delhi. They weighed approximately180 grains and were known by the name of Rupiyya and the copper coins were given the name of paisa but their weights vary to such an extent that it was difficult to say about the standard weight of the coins. Such heavy coins were unknown in the earlier period. Sher Shah silver coin exists from mints Arsah, Fathabad, Shirifabad, Qila Shergarh, Agrah, Chunar, Gwaliar, Hissar, Kalpi, Malot, Pandua, Qila Raisen, Ranthambhor, Rasulpur urf Patna, Satgaon, Sharifabad, Shergarh, Shergarh Bakkar, Shergarh Delhi, Ujjain, Shergarh Bihar and Agrah-Gwaliar type. Copper coins from Abu, Agrah, Alwar, Chunar, Delhi, Gwaliar, Hissar, Kalpi, Malot, Narnol, Sambal, Shergarh, Shergarh Qila, Biana, Lakhnau, Qila Raisen and various mintless. Goron D1009 / R1750 / NW1336B Paisa. Year: AH 953 (1546). Weight: 20.21g. Metal: Copper. Diameter: 22.50 mm. Edge: Plain. Alignment: Medal, but 25% rotated. Mint: Raisen. Obverse: "fi ahd al-amir al-hami al-din wa'l dayyan" with single line in the center. Reverse: abu'l muzaffar islam shah bin sher shah sultan khallada allah mulkahu. Mintage: N/A. Mintage Years: One year type. Ruler: Islam Shah Suri. Note: Islam Shah followed the style of his father coins. Among the round gold Mohur was from Shergadh urf Bakkar and square one from Agra-Gwaliar type. Silver coin mints were Agrah, Biana, Chunar, Fathabad, Gwaliar, Kalpi, Narnol, Patna, Qila Raisen, Satgaon, Sharifabad, Shergarh, Shergarh Bakar, Shergarh Delhi and including Jahanpanah and mintless types. Copper coins from mint Awadh, Budaon, Chunar, Gwaliar, Kalpi, Malot, Narnol, Raisen, Sambhal, Shahgarh, Shergarh Qanauj, "Budhandih ?" and various mintless. One common type referred as D980, stuck as Bengal type, probably at the provincial capital has the enigmatic number 1477 in Arabic numerals. The meaning of this has not been established. Goron D1050 / R1761 / NW1371-1381 / IMC 838-844 Paisa. Year: ND [AH 952-960 (1545-1553)]. Weight: 20.21g. Metal: Copper. Diameter: 23.00 mm. Edge: Plain. Alignment: Medal, but 25% rotated. Mint: N/A. Obverse: "fi ahd al-amir al-hami al-din wa'l dayyan" with single line in the center. 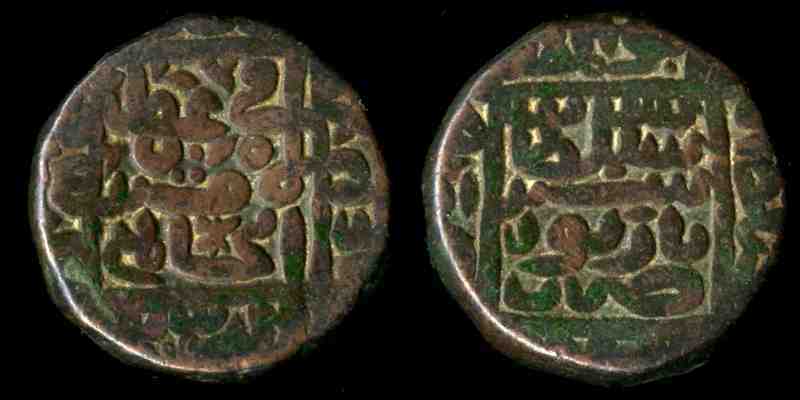 Reverse: abu'l muzaffar islam shah bin sher shah sultan khallada allah mulkahu. Mintage: AH 952-960 (1545-1553). Mintage Years: N/A. Ruler: Islam Shah Suri. Note: Many mintless types and varieties undoubtedly exists as this one. Leaf like mint mark over "khallada". Goron D1100 / R1839 / NW1436-1437 / IMC 878 Rupee. Year: AH 961 (1554). Weight: 11.28g. Metal: Silver. Diameter: 24.00 mm. Edge: Plain. Alignment: Medal. Mint: Narnol. Obverse: muhammad adil shah sultan khallada allah mulkahu and Nagari (within square). Mint anme in bottom marrgin. Reverse: la ilaha illa l-Lahi Muḥammadan rasulu l-Lahi [Shahada in center (there is no other god but Allah and Muhammad is the last messenger of Allah)]. Legends around the square. Mintage: N/A. Mintage Years: One year type. Ruler: Muhammad Adil Shah Suri. Paisa. Year: AH 962 (1555). Weight: 20.48g. Metal: Copper. Diameter: 21.00 mm. Edge: Plain. Alignment: Medal. Mint: N/A. Obverse: (not properly known/readable legends). Reverse: (not properly known/readable legends due to corrosion). Mintage: N/A. Mintage Years: AH 962. Ruler: Muhammad Adil Shah Suri (most likely). This coin dated AH 962 (1955) can falls under any of three rulers Muhammad Adil Shah, Sikandar Shah and Ibrahim Shah. It can only be identified if the reverse legends are more clearer. Goron D1126 / NW1471-1473 / IMC 891-892 Paisa. Year: AH 963 (1556). Weight: 20.61g. Metal: Copper. Diameter: 22.00 mm. Edge: Plain. Alignment: Medal. Mint: N/A. Obverse: (not properly known/readable legends). Reverse: abu'l muzaffar / muhammad shah / khallada allah mulkahu. Mintage: N/A. Mintage Years: AH 962-964. Ruler: Muhammad Adil Shah Suri. Muhammad Adil Shah silver coin are minted by Agrah, Chunar, Gwailor, Jhusi, Kalpi, Narnol, P(r)ayag, Shergarh Bakkar and mintless types. Copper coins were minted by Chunar, Gwailor, Jaunpur, Kalpi, Shahgarh and various mintless types.